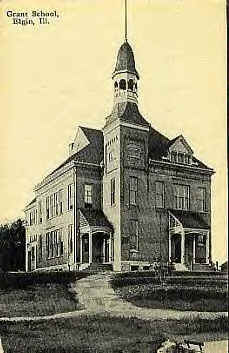 Despite the fact that Elgin is filled with schools, this is the first postcard that I have ever seen of one. It made me violate my rule of "no black and white postcards" on this site. Grant School, named after 18th President, Ulysses S. Grant, was originally named Mill Street School. It opened on September 7, 1866 and is still in use today. The school is a four-story brick building with high ceilings. While the school originally used steam heat and outdoor bathrooms, they have both been replaced with more modern conveniences.